We are excited to introduce a new way to help you quickly build useful and meaningful skills for Alexa. The new Decision Tree skill template makes it easy for developers and non-developers to create skills that ask you a series of questions and then give you an answer. This is a great starter for simple adventure games and magazine style quizzes like ‘what kind of job is good for me’. 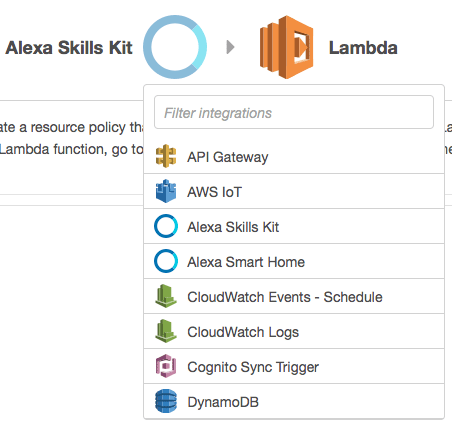 This template leverages AWS Lambda and the Alexa Skills Kit, and provides built-in business logic, use cases, error handling, and help functions for your new skill. Simply come up with the idea, plug in your decision tree content, and edit the sample provided. Follow this tutorial and we'll show you how it's done. 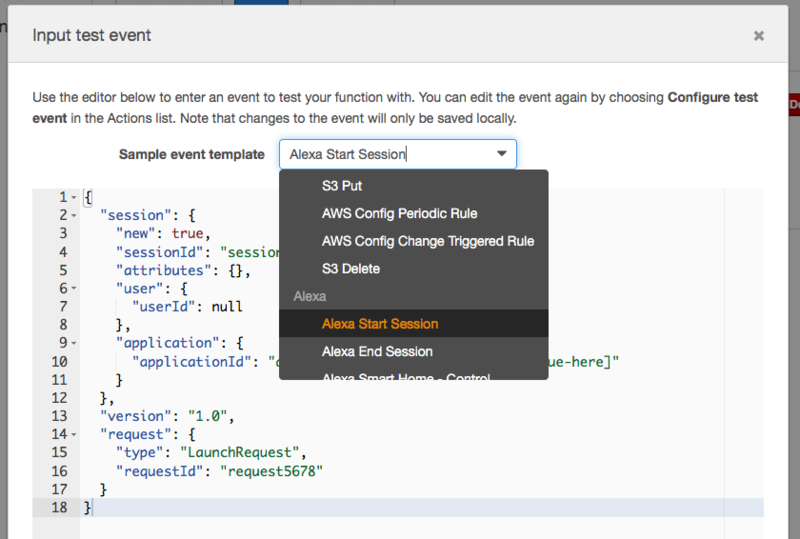 Using the Alexa Skills Kit, you can build an application that can receive and respond to voice requests made to Alexa. In this tutorial, you’ll build a web service to handle notifications from Alexa and map this service to a skill in the Amazon Developer Portal, making it available on your Echo, Alexa-enabled device, or Echosim.io for testing and to all Alexa users after publication. 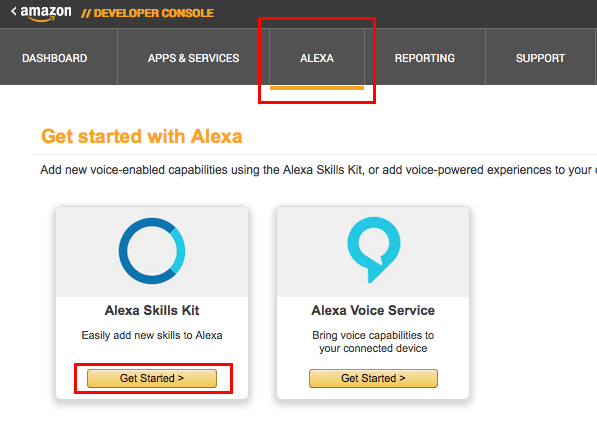 Create a skill - This tutorial will walk Alexa developers through all the required steps involved in creating a skill. No previous experience required. Design a Voice User Interface - Creating this skill will help you understand the basics of creating a working Voice User Interface (VUI) while using a cut/paste approach to development. You will learn by doing and end up with a published Alexa skill. This tutorial includes instructions on how to customize the skill and submit for certification. For guidance on designing a voice experience with Alexa you can also watch this video. 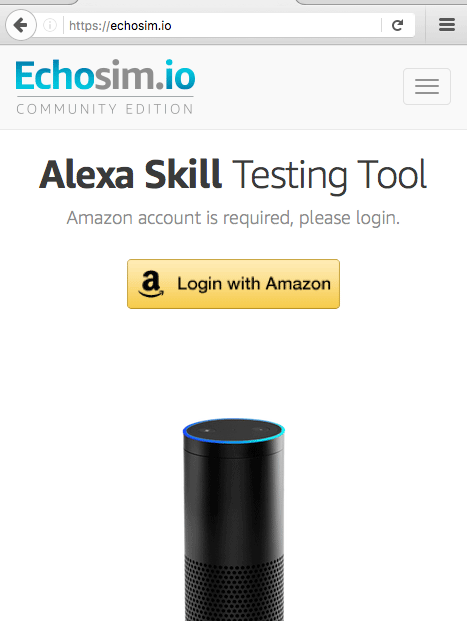 Get your skill published - Once you have completed your skill, this tutorial will guide you through testing your skill and sending your skill through the publication process to make it available for any Alexa user to enable. 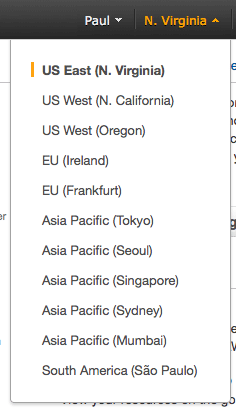 You will also need an AWS account and an Amazon Developer account. To get a refresher on how to do this, or if you are new to skill development, you can visit our training page to review our past tutorials. From: https://github.com/alexa you will need to get the Node SDK (https://github.com/alexa/alexa-skills-kit-sdk-for-nodejs) and the decision tree sample (https://github.com/alexa/skill-sample-nodejs-decision-tree). 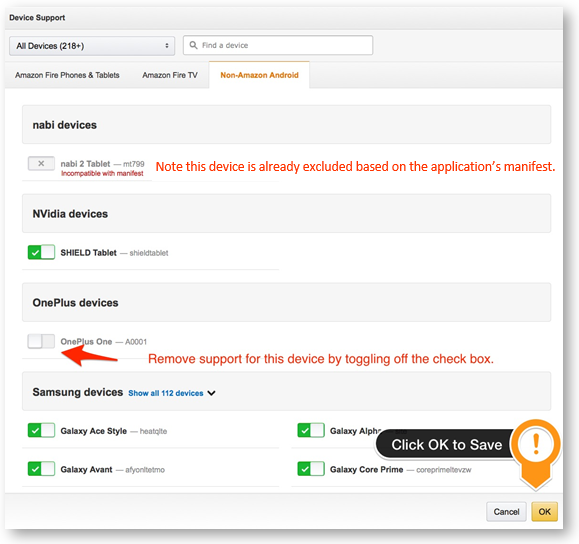 Once you have the files, we need to include the SDK in the sample that you’ll be working from. You can do this via NPM install or copy it manually. 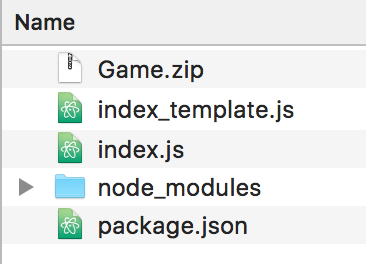 For NPM, Use terminal to navigate to the skill-sample-nodejs-decision-tree-master folder and install the sdk using the following npm command. Now, you will need to upload the zip file you just made into AWS Lambda. 2.1 Log into console.aws.amazon.com, make sure the region (top right corner) is set to N. Virginia, and click on Lambda (one of the compute services). 2.2 Choose Alexa Skills Kit for the trigger. 2.4 For ‘Code entry type’ choose ‘Upload a ZIP file’ and choose the ZIP you made in Step 1.3 of this tutorial. 2.5 For ‘Role’, choose ‘Create a custom role’ and then allow lambda_basic_execution in the new window that pops up. 2.6 Leave everything else as default, choose Next and Create Function. Ok, now your backend core logic is working. Now we need to build the user experience. 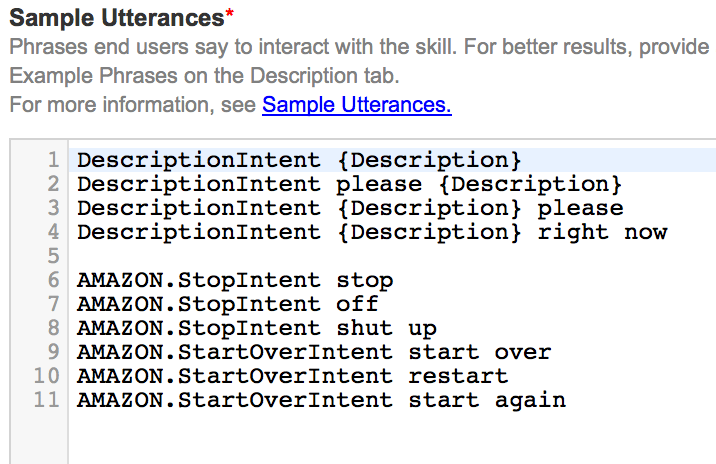 Skills are managed through the Amazon Developer Portal. 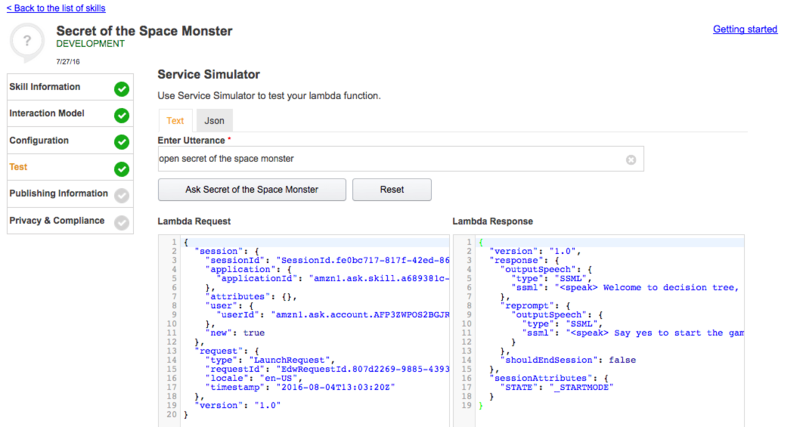 You will link the AWS Lambda function you created in the previous step to an Alexa skill defined in the Developer Portal. 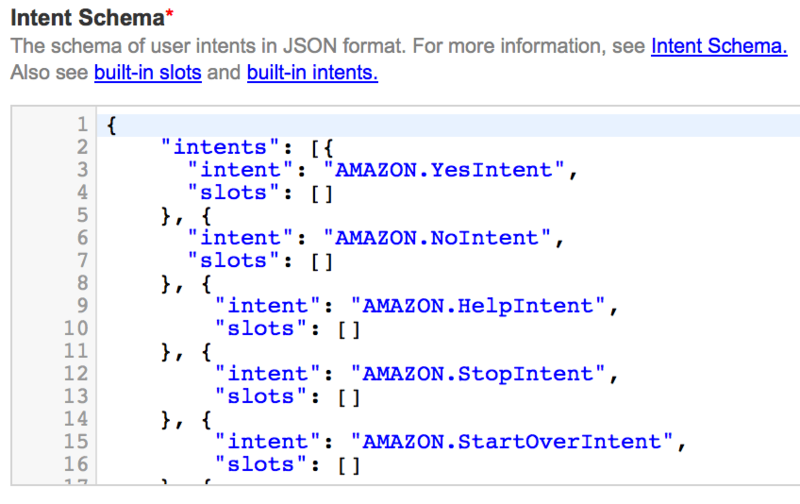 For this step, you’ll sign into http://developer.amazon.com. 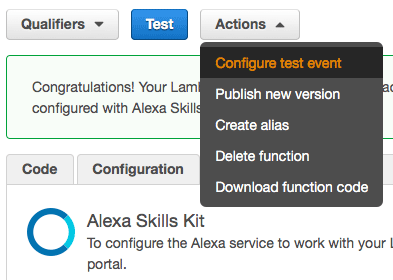 3.1 Go to Alexa in the navigation bar, choose ‘Alexa Skills Kit’, then ‘Get Started’ or ‘Add a New Skill’. This is the time to select the ‘Name’ and ‘Invocation name’ of the skill you are making. We will get the sample working before customizing the code, for now, select the name you want to use, and be aware that the ‘Invocation name’ is what users will have to say to launch your skill. We will customize the whole skill in step 4. When picking names, pay particular attention to the naming conventions shown in the tooltips and avoid any trademarked names or brands. Complete the ‘Interaction Model’ page using the content from the speechAssets folder you downloaded in step 1 of this tutorial. The Interaction Model includes the content for intents, sample utterances, and custom slot values. 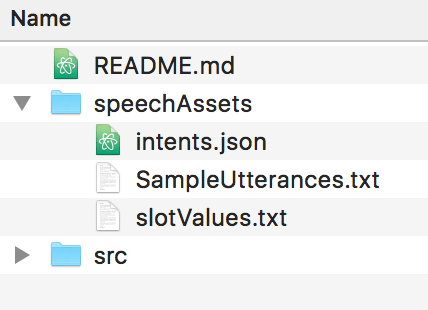 Finally, you can use the ‘Test’ page by typing ‘open’ the pressing ENTER in the ‘Enter Utterance’ box. You can hear Alexa’s response by clicking the play button in the lower right of the Lambda Response box. Good work. Now you have a skill that’s working end to end. 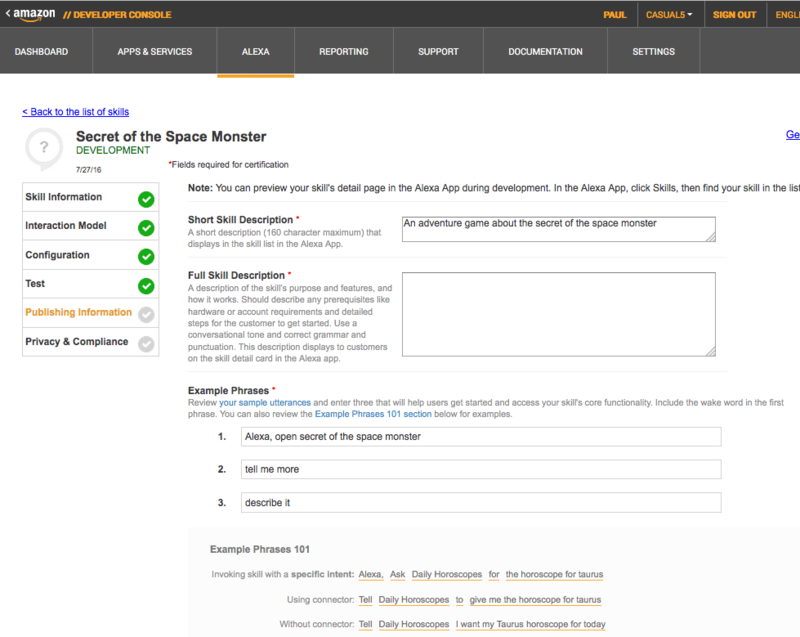 The next steps are to customize the skill to your own scenario and to publish it. Now let’s dig in and make some changes so that your skill delivers a unique and interesting experience. To do this, you will need to change the text. What do you want it to be about? What are your interests or hobbies? 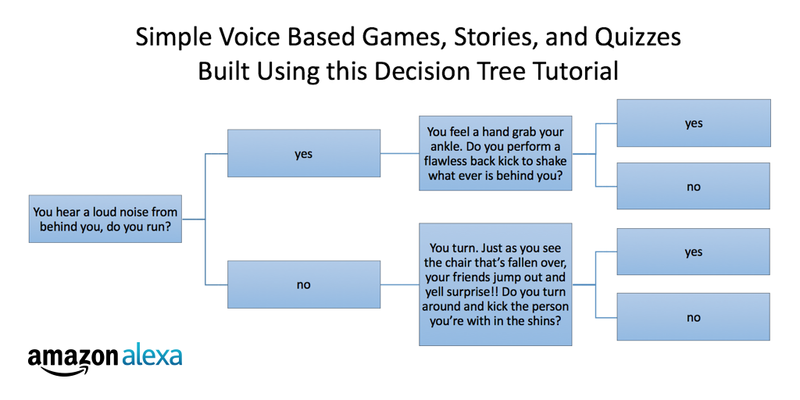 Will you make an adventure game, a quiz, something else? You can also choose to go farther and change the logic if you want. To get the full experience of building skills and exploring Voice User Experience, you should publish your skill and see what customers have to say about it. 4.1 Read the submission checklist and certification guidelines. You will need to describe your skill, add two icons, and give example utterances so that people know how to use it. The example utterances are important to get right. Carefully read the tool tips and the “Example Utterances 101” section on the Publishing Information page. The first example utterance needs to be “Alexa, open” followed by your invocation name. The other two examples should be utterances copied straight from the utterances list in your invocation model (do not include the intent, just the utterances). For the long description, provide information about the core functionality of the skill. For example “The Choose a Career skill will help you identify the type of job that might be best for you. Just answer a few yes or no questions and this skill will recommend a career for you!”. You should avoid referencing brands but if you do, be sure to clearly call out “not sponsored or endorsed by [brand name]”. 4.4 Double check your invocation name. Don’t use brands if you don’t own intellectual property, follow the certification guidelines, keep the text all lower case, avoid reserved works, and use proper abbreviations. You’ve submitted your skill for publication! You will receive progress emails and possibly other suggestions from the Alexa certification team on how you can make your skill even better. Remember, you can update your skill at any time. If you publish your skill by August 31 2016, you can get a free, limited edition Alexa dev t-shirt. Quantities are limited. See the complete terms and conditions here.